As soon as you can, you should get outside with your baby in the pram/buggy for a walk every day. Want to feel happier? Getting active is proven to combat mild depression. Five minutes round the block at a steady pace is all you need to do on your first outing. Get set up properly. The buggy handle should be level with your tummy button. Shoulders back and down, back straight, elbows in, tail-bone pointing down to floor (see postnatal posture correction section). Breathe deeply and enjoy the outdoors! Walking with a fellow new mum or two is ideal, why not set up your own walking group? 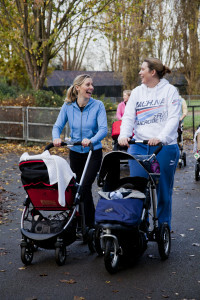 Once you can comfortably manage a short walk you can gradually introduce other gentle exercises with your buggy. Here are a few to try. Enjoy! Lunge walking: Pushing your buggy, make every 3rd step extra long and lunge forward so your back leg knee almost touches the floor (but doesn’t). The next step after your lunge needs to be a full-sized step, don’t let the lunge interrupt your stride. You’ll be alternating legs each lunge. Keep shoulders down and back straight, and don’t forget your pelvic floor and lower abs which should be activated. Buggy pushing side bend: Stand sideways on to buggy, feet shoulder width and with one hand on the handle the other stretched up over your head. Imagine 2 panes of glass in front and behind you and bend sideways in between them towards the buggy. Push the buggy away as you bend. Keep back straight and shoulders down and knees soft. Progress on to bending knees as you bend as well. Squats with buggy: Face buggy, feet hip width apart, back straight, hands on handle. Squat as you push buggy away then return to standing. Keep knees over toes, pull in belly and activate inner thighs and pelvic floor during motion. Begin without holding buggy if necessary. Crouched creeping: Hold buggy handle from underneath with palms facing upwards. Bend knees but keep back straight as if to lift the buggy by the handle (but don’t). Walk forwards keeping upper body at the same low height and position. Do not round the back but bend the knees to get as low as possible, holding the core active, pushing your tailbone down towards the floor. At Ready Steady Mums we often joke about needing do hide to do silly exercises like these, but check out the This Girl Can campaign for some inspiration for overcoming fear of judgement and looking silly with your buggy in the park!